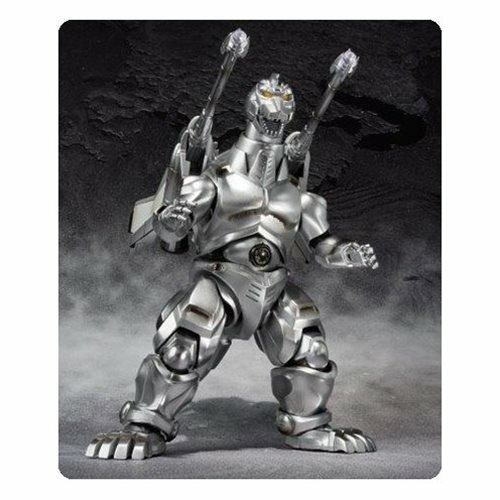 This is a reissue of the Mechagodzilla MonsterArts, but now including the previously limited Garuda pack. Due June 2017 for $114.99 from Entertainment Earth. Super Mechagodzilla takes off with SH MonsterArts! UX-02-93 Mechagodzilla's neck parts and articulated tail have been expertly crafted so that a flying pose can be re-enacted with ease. Of course, the Garuda part can be attached or removed for even more posing possibilities! Set includes interchangeable body part, 2 interchangeable hand parts, Garuda, Garuda attachment parts, and special display stand. Measures approximately 6-inches tall. Order Godzilla vs. Mechagodzilla Super Mechagodzilla MonsterArts from Entertainment Earth!